Trend data shows Amazon taking search market share from engines as the preferred place to begin researching for information about products and services. Raymond James analysts examined Google Search Trend data, which looks at a sample of searches on Google, to analyze searches and traffic to a handful of ecommerce company Web sites. The search data does not include app traffic. 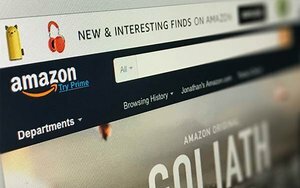 The firm's analysis found that Amazon led 52% to search engines at 26% in December 2016, when it comes to searching for a product to buy online. Those percentages rose dramatically from 28% for Amazon and 55% for search engines in December 2014. Google Trends data suggests global searches for Amazon rose 10% during the fourth quarter of 2016 and 19% in the third quarter of 2016, compared with the year-ago quarters. Searches on Amazon in the U.S. rose 8% YoY in the fourth quarter vs. 8% in the third-quarter of 2016. U.K. searches rose 1% vs. 4%; Japan rose 5% vs. declining 7%; and Germany rose 6% vs. 12%, respectively. The same cannot be said for eBay. The marketplace's search traffic fell 16% YoY during the fourth quarter versus 14% in the third quarter in 2016, per Google Trends data analyzed by Raymond James analysts. Regionally, searches in the U.S. fell 16% YoY versus 14% in the third quarter. Searches in the U.K. for eBay fell 13% YoY versus 16%, and in Germany fell 13% versus 11%, respectively. The Raymond James note also highlights that searches for Wayfair rose 42% YoY in the fourth quarter of 2016 versus 53% in the third quarter. Wayfair television advertising spiked during the holiday season, but it's not clear whether the increase contributed to the uptick in awareness. Raymond James Analyst Aaron Kessler says Wayfair's brand awareness continues to rise. "It's potentially from Millennials buying home goods online," he says, attributing the increase in searches to a "generational shift." Overall, online purchases grew as a percentage of total sales, according to FirstData -- reaching up from 20.2% in 2015 to 25.8% in 2016 during the holiday season. Retail Categories lagged behind non-retail store ecommerce as a percentage of total sales due in part to what FirstData calls the "try it before you buy it" propensity, especially in electronics and appliance categories. General merchandise stores and value retailers experienced the most online growth, 29%, compared with the year-ago period, during the end of the season. Sporting Goods, Hobby, and Book and Music stores followed with 19%. Building Equipment and Garden supplies took 17%, followed by Electronics and Appliances at 13.2%, according to FirstData.